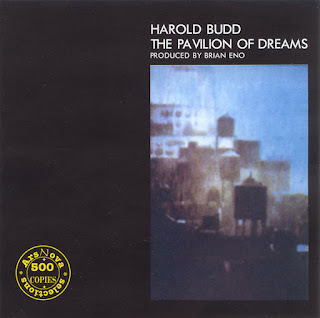 Harold Budd had accomplished much before releasing any of the music he would become primarily associated with, particularly the two collaborations with Brian Eno and The Moon and the Melodies with Cocteau Twins. He already gained attention in the American avant-garde music community way back in the 1960s. He had attained a music degree from the University of Southern California and then went into teaching for a number of years. He at one point retired from his composing, which at times emphasized drone music, chamber music, and the use of jazz instruments in unconventional, avant-garde compositions. Budd's work became increasingly minimalist over the years. Understanding these developments explains how the strange, nocturnal, yet soothing nature of The Pavilion of Dreams came to be. The Pavilion of Dreams took years to record, then an additional two years to be released. It's a complex, challenging work that feels spiritual while also invoking a noir atmosphere. Due to all his experience and knowledge gained thus far, Harold Budd developed a piano playing technique that emphasized slow, sustained notes, calling it the "soft pedal." Budd's piano playing is at the center of The Pavilion of Dreams, acting as the foundation for all manner of classical and jazz instruments to dance along to in unconventional directions. The centerpiece of the album, opener "Bismillahi 'Rrahman 'Rrahim," (Arabic for "In The Name of God, The Beneficent, The Merciful") is led by seasoned jazz musician Marion Brown. His soulful saxophone playing lends a smoky atmosphere alongside the dancing marimbas and Budd's piano melodies, oozing mystery. The piece unfolds gradually, following no conventional avenue and becoming an auditory hallucination. At nearly twenty minutes in length, the changing dynamics emulate the rise and fall of sea tides and maintains a consistent, absorbing atmosphere. The following three pieces go into new territory while keeping with the grounded and unpredictable nature of the opening piece. "Two Songs: 1. Let Us Go into the House of the Lord / 2. Butterfly Sunday" is more sober, sounding like an improvisational harp solo piece with an operatic vocal line singing over it. The track sounds nice, but feels more like an extended interlude sandwiched between the massive "Bismillahi 'Rrahman 'Rrahim" and preceding the similarly phantasmatic "Madrigals of the Rose Angel: 1. Rossetti Noise / 2. The Crystal Garden and a Coda," which introduces choral voice harmonies and emphasized piano melodies. The piece resembles the soundtrack to a nighttime fantasy. Album closer "Juno" is even more piano-centric, foreshadowing his piano playing in the Brian Eno collaboration Ambient 2: The Plateaux of Mirror, one of the finest albums either composer has been involved in. Each of these three pieces feature vocals (without lyrics), and while they can be a bit overdone at times, serve as an effective part of the overall whole. The atmosphere of The Pavilion of Dreams is incredible, laying the groundwork for the somber pieces of the other brilliant Brian Eno collaboration, The Pearl. The dreamy soundscapes are a perfect match for Brian Eno to produce, who plays a crucial role in how everything came together in the studio. It's clear that their future work together would not exist in the way that it does if not for working on this first. The Pavilion of Dreams is is an engrossing listening experience, being ahead of its time for unconventional usage of classical and jazz instruments in service of a nuanced, tranquil exploration of nuanced ambient textures.